Electrical safety; How to do electrical jobs in a safe way and understand why electrical work at home can be dangerous. Use our safety check list or get a good understanding of the components that assist with electrical safety such as fuses and cables. Electrical regulations must be followed by law. If you are not a competent person under the regulations do not attempt electrical work. Click here for the meaning of competency. Not following electrical regulations and ignoring electrical safety is responsible for many deaths every year in this Country. This is why the Government have bought in more electrical regulations in the form of Part P.
35% of homeowners said their electrics were older than 15 years and had not been checked. Please also see our project on the New Wiring and Cable Colours. Please remember when attempting any electrical installations at home that you are obliged to get the completed job tested by a fully qualified electrician and obtain a minor works certificate. Failure to do this may render your house insurance invalid and you may have difficulty selling your home. Check all walls for wires and pipes before cutting out for any new cables and boxes. A detector such as the one below can identify cables in the wall. If in any doubt whatever consult a qualified electrician. There is a legal requirement to obtain a completion certificate from a qualified electrician for any work you do that requires a mains connection. For any work within circuits a minor works certificate should be obtained. Turn off the power and remove the fuse from any circuit you are working on. Make sure no-one can turn the power on by mistake. An electrical supply will come to your home at a main, sealed fuse called a service head and from there will go to your meter via one large red and one large black wire. 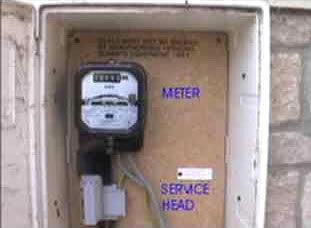 The meter measures how much electricity you use. At no time should you touch either the service head or the meter. From here the electricity will go to your consumer unit, from where it is distributed around the house. Each circuit is fused at this box either by an amp rated fuse wire, or a trip switch if you have an RCD (Residual Current Device). The amount of electricity available to you is measured in Volts, and the rate at which it flows along its conductors is measured in amps. The power required by any appliance is measured in Watts. The formula for working out the correct cable and fuse is; Watts / Volts = Amps (or watts divided by volts equals amps). A way to picture the volts is as the "potential difference" such as the height of a hill (metaphorically speaking), and the Amps are the rate that the electricity is “allowed to roll down the hill”. Resistance stops or slows the rate of flow “down the hill” and this is measured in Ohms. Remember your consumer meter does not actually measure volts or amps, it measures energy that is consumed which is the amount of Watts that are used every hour by all the electrical appliances you are using, generally referred to as kWh or Kilowatt hours. The amount of electricity used (rather than electricity available – Volts) is measured in Amp/Hours. You can think of this as the "flow per hour" if we use our hill analogy. Electricity flows along the live wire, feeding whatever is required and then returns along the neutral wire to its local transformer. 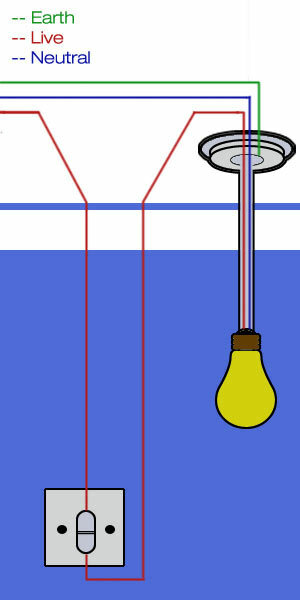 The flow can be stopped by the insertion of a switch, which for all practical DIY purposes is placed in the live wire. Switches, most often, will be linked from your ceiling rose through a separate cable, even though one of the wires in this cable is black it is still live. Electricity will always find the shortest or easiest route and you may represent that route, so be careful! Unless your house was built after May 2004 then chances are you will have the old coloured wiring and/or a combination of old and new wiring colours as part of your electrical system. For more details about wiring colours and the safety consideration, see our project here. Fixed wiring is done in cable. This consists of individual conductors (wires) sheathed separately, by insulation to prevent leakage. The earth or "ground" wire is normally bare. The wires are then jointly covered by the outer sheath. The wires are colour coded, red for live, black for neutral and green/yellow striped for earth, where this is covered. Modern cables are sheathed with PVC which has an indefinite life, older cables were rubber with about 20/30 years life. If your home has these cables do not attempt electrical extensions with them. When installed, bare earth wires should be covered with an "earth sleeve" which can be bought in all sizes at an electrical store or most diy stores. 1.5mm is most common in lighting circuits. When installed it must not exceed 110m in length and carries a fuse rating of 5amps. 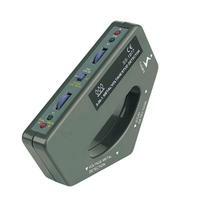 (6 amps if used in conjunction with a miniature circuit breaker). It is acceptable to run 1200 Watts on this cable, the equivalent of 12 x 100 Watt bulbs, but lighting circuits are normally run independently on each floor of your house. 2.5mm (as above but larger) is usually used for the installation of power sockets on a ring main. The circuit uses a 30 amp fuse at the consumer unit (32 with a MCB). Cable length must not exceed 60m or 50m with an MCB. Flex, is simply flexible cable and is used for connecting appliances. The colour coding is different using brown for live, blue for neutral and green/yellow stripes for earth. There are many more cables for connecting cookers etc, but these are generally run directly from the consumer unit and require a professional electrician for their installation. You may also find it necessary to run some cables through plasterboard walls or ceilings, ceiling joists and other timber materials. If this is the case then the best thing to use is a flat drill bit or hybrid drill bit as these types of bit will cut a nice clean and tidy hole through what ever surface you are drilling into (for more information see our tool review on flat drill bits and also our review of the hybrid drill bit). Fuses are placed into a circuit as a deliberate weak point. If anything goes wrong within your circuit, the fuse will "blow" first. With the modern RCD boxes, the trip switch will go. BUT BEFORE YOU PUSH IT BACK ON, LOCATE THE REASON WHY IT TRIPPED. Most of the time it is because the circuit has been overloaded or there is an earth fault. If you are in doubt contact an electrician. How Does a Ceiling Rose Work? We have included ceiling roses in this section because it is the most misunderstood fitting of all. Many people think they can take the old one off, do not mark the wires, and connect a new fitting, black to black, red to red. It is not that easy, because in the majority of cases your light switch will be wired to the rose, and in that case, at least one of the black wires will be live. 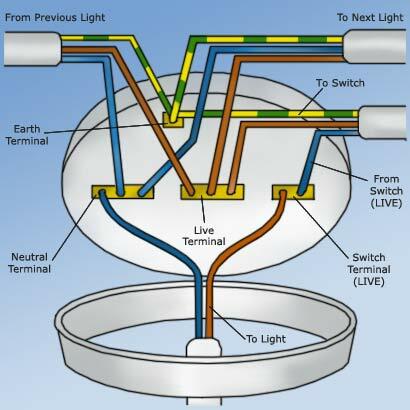 Below is a diagram of a wired ceiling rose showing you what to look for when working with one. Am I Up To Date On Wiring Regulations For Electrical Safety?